Listen to the podcast. Find it on iTunes/iPod and Podcast.com. Read a full transcript or download a copy. Sponsor: HP. 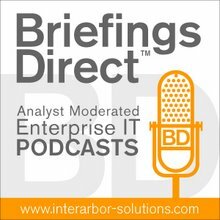 The latest BriefingsDirect podcast hones in on managing risks and rewards in the proper placement of enterprise data in cloud computing environments. Headlines tell us that Internet-based threats are becoming increasingly malicious, damaging, and sophisticated. These reports come just as more companies are adopting cloud practices and placing mission-critical data into cloud hosts, both public and private. Cloud skeptics frequently point to security risks as a reason for cautiously using cloud services. It’s the security around sensitive data that seems to concern many folks inside of enterprises. There are also regulations and compliance issues that can vary from location to location, country to country and industry by industry. Yet cloud advocates point to the benefits of systemic security as an outcome of cloud architectures and methods. Distributed events and strategies based on cloud computing security solutions should therefore be a priority and prompt even more enterprise data to be stored, shared, and analyzed by a cloud by using strong governance and policy-driven controls. So, where’s the reality amid the mixed perceptions and vision around cloud-based data? More importantly, what should those evaluating cloud services know about data and security solutions that will help to make their applications and data less vulnerable in general? We've assembled a panel of HP experts to delve into the dos and don’ts of cloud computing and corporate data. Please welcome Christian Verstraete, Chief Technology Officer for Manufacturing and Distributions Industries Worldwide at HP, and Archie Reed, HP's Chief Technologist for Cloud Security, the author of several publications including, The Definitive Guide to Identity Management and he's working on a new book, The Concise Guide to Cloud Computing. The discussion is moderated by Dana Gardner, principal analyst at Interarbor Solutions. Reed: If you look at the history that we’re dealing with here, companies have been doing those sorts of things with outsourcing models or sharing with partners or indeed community type environments for some time. The big difference with this thing we call cloud computing, is that the vendors advancing the space have not developed comprehensive service level agreements (SLAs), terms of service, and those sorts of things, or are riding on very thin security guarantees. Therefore, when we start to think about all the attributes of cloud computing -- elasticity, speed of provisioning, and those sorts of things -- the way in which a lot of companies that are offering cloud services get those capabilities, at least today, are by minimizing or doing away with security and protection mechanisms, as well as some of the other guarantees of service levels. That’s not to dismiss their capabilities, their up-time, or anything like that, but the guarantees are not there. So that arguably is a big difference that I see here. The point that I generally make around the concerns is that companies should not just declare cloud, cloud services, or cloud computing secure or insecure. It’s all about context and risk analysis. By that, I mean that you need to have a clear understanding of what you’re getting for what price and the risks associated with that and then create a vision about what you want and need from the cloud services. Then, you can put in the security implications of what it is that you’re looking at. Verstraete: People need to look at the cloud with their eyes wide open. I'm sorry for the stupid wordplay, but the cloud is very foggy, in the sense that there are a lot of unknowns, when you start and when you subscribe to a cloud service. Archie talked about the very limited SLAs, the very limited pieces of information that you receive on the one hand. On the other hand, when you go for service, there is often a whole supply chain of companies that are actually going to join forces to deliver you that service, and there's no visibility of what actually happens in there. I’m not saying that people shouldn't go to the cloud. I actually believe that the cloud is something that is very useful for companies to do things that they have not done in the past -- and I’ll give a couple of examples in a minute. But they should really assess what type of data they actually want to put in the cloud, how risky it would be if that data got public in one way, form, or shape, and assess what the implications are. As companies are required to work more closely with the rest of their ecosystem, cloud services is an easy way to do that. It’s a concept that is reasonably well-known under the label of community cloud. It’s one of those that is actually starting to pop up. A lot of companies are interested in doing that sort of thing and are interested in putting data in the cloud to achieve that and address some of the new needs that they have due to the fact that they become leaner in their operations, they become more global, and they're required to work much more closely with their suppliers, their distribution partners, and everybody else. It’s really understanding, on one hand, what you get into and assessing what makes sense and what doesn’t make sense, what’s really critical for you and what is less critical. Reed: At the RSA Conference in San Francisco, We spoke about what we called the seven deadly sins of cloud. ... One of the threats was data loss or leakage. In that, you have examples such as insufficient authentication, authorization, and all that, but also lack of encryption or inconsistent use of encryption, operational failures, and data center liability. All these things point to how to protect the data. One of the key things we put forward as part of thethe Cloud Security Alliance (CSA) announcement that HP was active in was to try and draw out key areas that people need to focus on as they consider the cloud and try and deliver on the promises of what cloud brings to the market. Although cloud introduces new capabilities and new options for getting services, commonly referred to as infrastructure or platform or software, the security posture of a company does not need to necessarily change significantly -- and I'll say this very carefully -- from what it should be. A lot of companies do not have a good security posture. You need to understand what regs, guidance, and policies you have from external resources, government, and industry, as well as your own internal approaches, and then be able to prove that you did the right thing. When we talk to folks about how to manage their approach to cloud or security in general, we have a very simple philosophy. We put out a high-level strategy called HP Secure Advantage, and it has three tenets. The first is to protect the data. We go a lot into data classification, data protection mechanisms, the privacy management, and those sorts of things. The second tenet is to defend the resources which is generally about infrastructure security. In some cases, you have to worry about it less when you go into the cloud per se, because you're not responsible for all the infrastructure, but you do have to understand what infrastructure is in play to feed your risk analysis. The third part of that validating compliance is the traditional governance, risk, and compliance management aspects. You need to understand what regulations, guidance, and policies you have from external resources, government, and industry, as well as your own internal approaches -- and then be able to prove that you did the right thing. Verstraete: Going to the cloud is actually a very good moment for companies to really sit down and think about what is absolutely critical for my enterprise and what are things that, if they leak out, if they get known, it's not too bad. It's not great in any case, but it's not too bad. And, data classification is a very interesting exercise that enterprises should do, if they really want to go to the cloud, and particularly to the public clouds. I've seen too many companies jumping in without that step and being burnt in one way, form, or shape. It's sitting down and think through that, thinking through, "What are my key assets? What are the things that I never want to let go that are absolutely critical? On the other hand, what are the things that I quite frankly don't care too much about?" It's building that understanding that is actually critical. ... Today, because of the term "cloud," most of the cloud providers are getting away with providing very little information, setting up SLAs that frankly don't mean a lot. It's quite interesting to read a number of the SLAs from the major either infrastructure-as-a-service (IaaS) or PaaS providers. Fundamentally, they take no responsibility, or very little responsibility, and they don't tell you what they do to secure the environment in which they ask you to operate. The reason they give is, "Well, if I tell you, hackers can know, and that's going to make it easier for them to hack the environment and to limit our security." There is a point there, but that makes it difficult for people who really want to have source code, as in your example. That's relevant and important for them, because you have source code that’s not too bad and source code that's very critical. To put that source code in the cloud, if you don't know what's actually being done, is probably worse than being able to make an assessment and have a very clear risk assessment. Then, you know what the level of risk is that you take. Today, you don't know in many situations. Reed: Also consider that there are things like community clouds out there. I'll give the example of US Department of Defense back in 2008. HP worked with the Defense Information Systems Agency (DISA) to deploy cloud computing infrastructure. And, we created RACE, which is the Rapid Access Computing Environment, to set things up really quickly. Within that, they share those resources to a community of users in a secure manner and they store all sorts of things in that. And, not to point fingers or anything, but the comment is, "Our cloud is better than Google's." So, there are secure clouds out there. It's just that when we think about things like the visceral reaction that the cloud is insecure, it's not necessarily correct. It's insecure for certain instances, and we've got to be specific about those instances. In the case of DISA, they have a highly secured cloud, and that's where we expect things to go and evolve into a set of cloud offerings that are stratified by the level of security they provide, the level of cost, right down to SLA’s and guarantees, and we’re already seeing that in these examples. While we’ve alluded to, and actually discussed, specific examples of security concerns and data issues, the fact is, if you get this right, you have the opportunity to accelerate your business, because you can basically break ahead of the competition. Now, if you’re in a community cloud, standards may help you, or approaches that everyone agrees on may help the overall industry. But, you also get faster access to all that stuff. You also get capacity that you can share with the rest of the community. If you're thinking about cloud in general, in isolation, and by that I mean that you, as an individual organization, are going out and looking for those cloud resources, then you’re going to get that ability to expand well beyond what your internal IT department. There are lots of things we could close on, of course, but I think that the IT department of today, as far as cloud goes, has the opportunity not only to deliver and better manage what they’re doing in terms of providing services for the organization, but also have a responsibility to do this right and understand the security implications and represent those appropriately to the company such that they can deliver that accelerated capability.